Are you following me on Instagram? You should be! 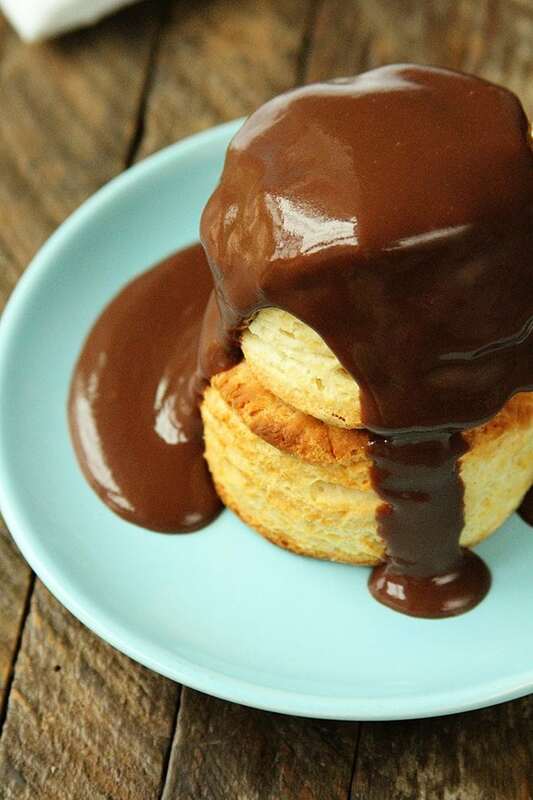 What can I say about Chocolate Gravy? I mean… it’s chocolate. And it’s gravy. It’s chocolate gravy. I love it on hot biscuits, but it’s great on pound cake, ice cream, just about anything! You’re going to want to to make this ASAP. And you’re going to want to put it on everything. Not only is it delicious, it’s incredibly easy to make, too! Yeah, it takes a little bit of stirring to keep it from scorching, but that’s a pretty easy task. And the end result is the most delicious, velvety chocolate sauce. In my own bizarre brain, I feel like chocolate gravy is seen as kid food, but I assure you one taste of this stuff and you’ll realize this deliciousness shouldn’t be relegated to only the little folks. It’s a delicious treat the whole family will love for breakfast or dessert! It’s a simple but delicious sauce that will turn any ordinary meal into something extraordinary! In a medium saucepan, whisk together the cocoa powder, flour, sugar, and salt. Pour in the milk and whisk until all the lumps are gone. Place the pan over medium heat and cook 5 to 7 minutes, stirring constantly, until the gravy just begins to boil and then thickens. Once thick, remove from the heat stir in the butter and vanilla. Stir until the butter has melted. Serve over hot biscuits, pound cake, or even over ice cream! It’s so funny that you posted this. I was just discussing chocolate gravy with my mother on Sunday. My granny used to make us grandkids stir and stir and stir for her and I can remember my arm getting tired. My mother has tried making chocolate gravy but it just doesn’t to taste the same as I remember it. Maybe it was the pot Granny used to cook it in. Maybe it was because she just threw in ingredients and didn’t measure so we don’t know her ‘recipe’. She made the best buttermilk biscuits so I sometimes wonder if that was part of it too. I definitely need to try your recipe and see if it’s close to what I remember. My mom made chocolate gravy also and us kids loved it to death…she also made her home made buttermilk biscuits..as far as the chocolate went, she never used salt, or vanilla extract,her ingredients were hersheys chocolate, flour sugar, water and milk and we put butter in our plates or bowls then the chocolate was poured over the butter, the biscuits were the best part to go along with the chocolate..sometimes we used toast or just bread, we used to break up pieces of bread and poured the chocolate over the bread and added the butter…it was yummmmm yummmmm… now im vegetarian im wondering if i could wheat flour and my stomach cant handle anything with folic acid in it so i also wondering if i used silk milk for the liquid mixture part of the ingredients..can u help me out on this before i make it how it would be as far as taste is concerned….THANKS.. I think you could definitely make that work! 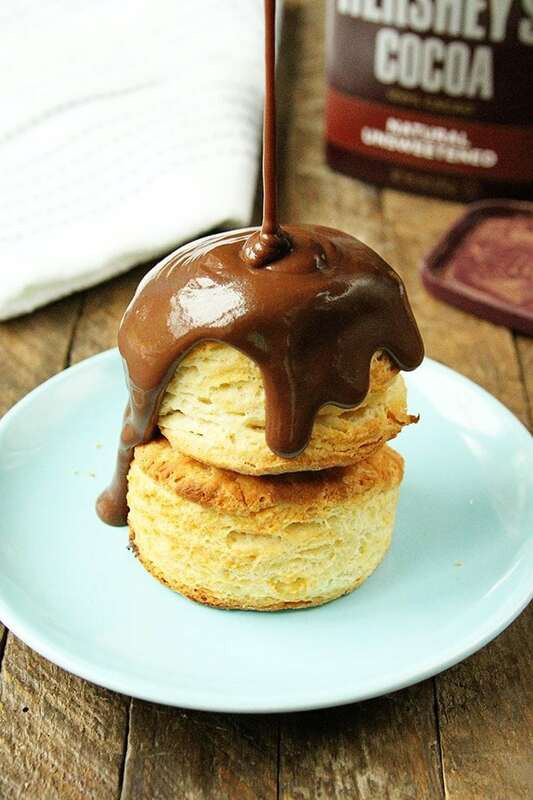 Chocolate gravy is a specialty in my husband’s family—new to me when I married into the family, but I very quickly became a convert! As delicious as it is warm poured over biscuits, it is equally delicious chilled and eaten the next day. Make a double batch and chill small cups of it to enjoy as a decadent pudding-like dessert the next day! Yummmm! Are there tricks to making a double batch, or do you just straight double everything? When I was a very young woman,I have an aunt, her name was.Annuschka She has taught me make chocolate gravy and my young husband liked it very much. Annuschka has said that when the gravy had completed must put it in little porceain or glass bowls and whipped cream on them top. When I have some visitors, my family or friends, they all knows – now they eat my fantastic chocolate gravy. Today I make it for my grandchildren and think with thankfulness to my aunt, Annushka. Love that!! Once it cools, it is very pudding like, so I love that idea! The first time I heard a co-worker mention chocolate gravy, I thought my ears had not heard her right. I asked her to repeat and when she graciously did so, I thought she was pulling my leg. LOL She called her mother to get her version of the recipe, made it and biscuits for me to try and I was impressed!! Now I will have to try your recipe, Stacey. I’m sure I will enjoy it. I’ll let you know. Please do! I sure hope you enjoy it! How is it stored and how long will it last, if you don’t eat it all right away? You can store it covered in the fridge for a few days. 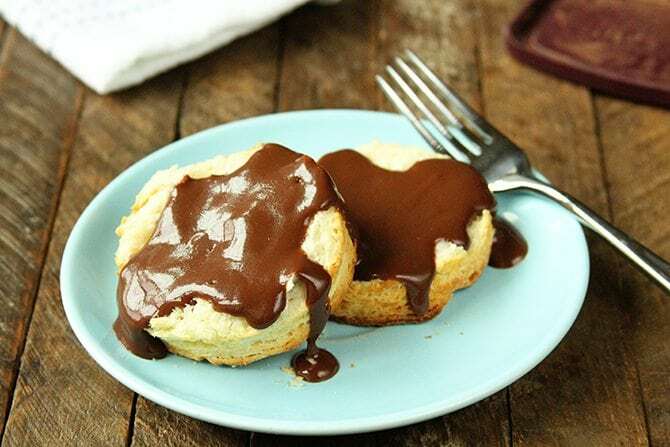 When I was growing up we had chocolate gravy over plain vanilla muffins (my mom didn’t like biscuits…shameless! Either way it great stuff! Ha! I’ll take Chocolate Gravy any way I can get it! 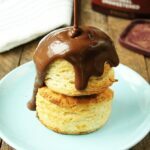 I love chocolate gravy and have developed an easy recipe for just about anyone that likes a darker chocolate taste….. the base is 1/4 C sugar to 1 heaping T of cocoa powder. This is easy to make a whole batch for family or just a bit for a solo breakfast, just keep adding the same amount of sugar to the same amount of cocoa. Then I add the milk by sight and cook and stir until reduced. We leave it on the stove for most of the day, swiping a finger full as we go by……think I’ll make some up for dinner…..yum!! Stacey!!! Chocolate Gravy!!!!! Naughty, naughty!!! Could I possibly use hot cocoa mix instead of regular cocoa powder? I think, in this case, cocoa powder is just going to be best.